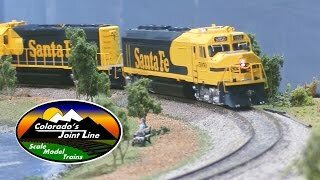 Model railroad operations session on my HO scale model train layout. My layout is based upon Colorado’s Joint Line between Denver and Palmer Lake. Trains include Rio Grande, Santa Fe, and Burlington Northern. All trains are operating with cabooses in this 1985 ops session.